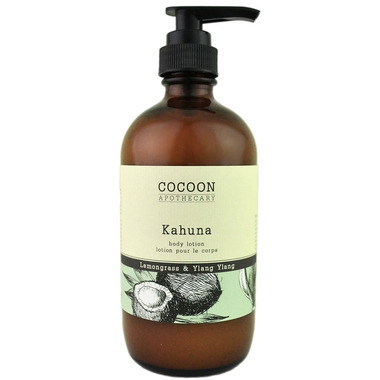 The Cocoon Apothecary Kahuna Body Lotion is a 100% plant-based body lotion that smells like paradise with the organic essential oils of lemongrass and ylang ylang. Super-hydrating and fast-absorbing, Kahuna locks in moisture with the nourishing oils of virgin coconut and macadamia nut. Lemongrass and ylang ylang create a sweet, floral, citrus scent. Treat yourself to a trip to the tropics every time you moisturize. Nourishing ingredients for keeping skin healthy. Ingredients: Purified water, certified organic olive oil, cetearyl alcohol (plant-based), stearic acid (plant-based), glycerin (from non-GMO canola), certified organic lavender essential oil, certified organic rosemary essential oil, sodium anisate (from basil), sodium levulinate (from non-GMO corn), sodium cetearyl sulfate (plant-based), vitamin E, glyceryl caprylate (from coconut).